To Curb Ocean Pollution, U.K. May Ban Plastic Straws, Stirrers And Cotton Swabs : The Two-Way Prime Minister Theresa May called plastic waste "one of the greatest environmental challenges facing the world." The government said it will work with industry to develop alternatives. Downing Street said an end to sales of the single-use products is expected after the government launches a "consultation" later this year. May's statement also said the government "will work with industry to develop alternatives and ensure there is sufficient time to adapt. It will also propose excluding plastic straws for medical reasons." "When ministers talk of the UK leading the world on this hot topic it's worth casting an eye over the actions of other countries. Dozens have actually banned plastic bags — Britain has a system of retailers having to charge for them. "And since last year Kenya has adopted the most draconian measures of all: there are fines if you use a plastic bag and if business people are caught making or importing them, they actually face up to four years in jail." "In recent months, Mr Gove has announced plans to force thousands of small retailers in England to charge 5p for plastic bags and introduced a ban on the microbeads used in facial scrubs and toothpaste. "He has also announced a consultation on the introduction of a deposit system for plastic bottles and cans, but he faced criticism on Wednesday over a 'lack of urgency' in efforts to introduce such a scheme. "Speaking to the Commons environmental audit committee on Wednesday, Mr Gove said he hoped the deposit scheme would become law by 2020. "Mary Creagh, the committee's chairwoman, responded: 'It is disappointing that having announced the deposit return scheme last year, the government will not be bringing in this vital part of tackling plastic waste until 2020 at the earliest.' "
In February, Gove tussled with European Commission Vice-President Frans Timmermans on Twitter over whether it was the U.K. or EU that was moving faster in banning single-use plastics. Music festivals in the U.K. aren't waiting for legislation, though. 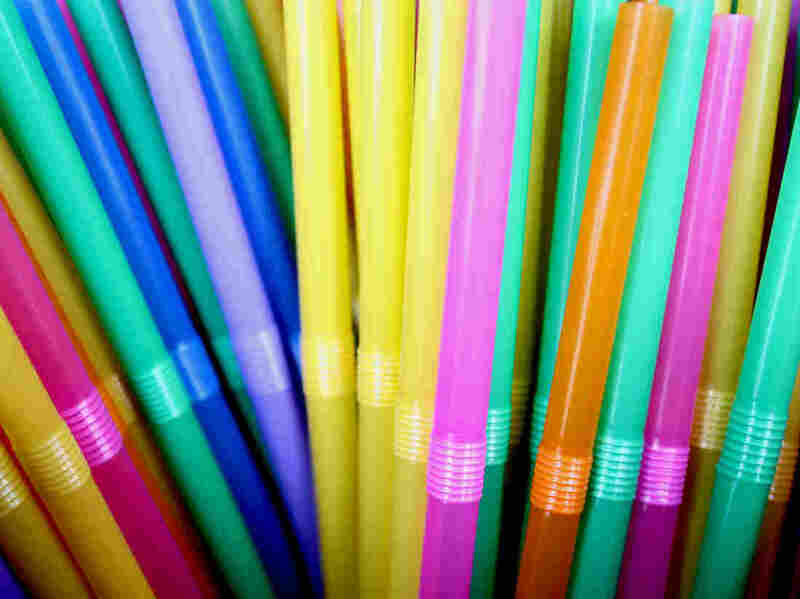 Organizers at the 60-some member Association of Independent Festivals committed to banning plastic straws at their events this season, and pledged to eliminate all single-use plastic at their events by 2021. The Glastonbury Festival previously announced its own ban on plastic bottles at its 2019 event. An estimated one million plastic bottles are used at the festival each year. In the U.S., a number of major cities have enacted plastic bag bans or fees; such measures are often highly contentious. And starting June 1, the city of Malibu, Calif., will ban restaurants and food vendors from offering or selling plastic straws, stirrers or utensils. NPR's Andrew Flanagan contributed to this report.